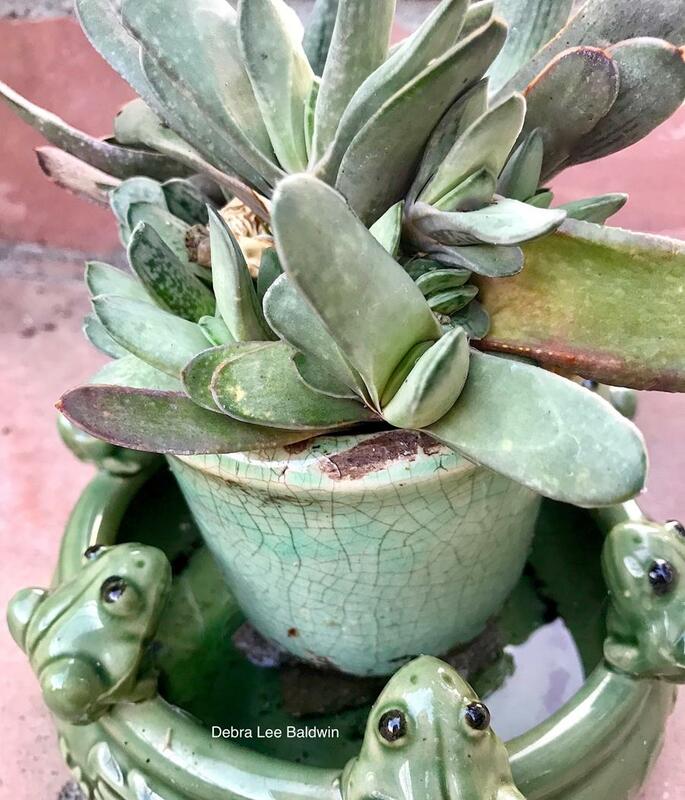 Inspired by my friend Sabine’s holiday succulent garden, I decided to light up a succulent of my own. The resulting potted ferocactus is the holiday centerpiece for a patio table visible from my kitchen and dining room. The plant’s translucent spines glow when light shines through them, creating a fascinating display. I painted the pot to match the gold of the spines so the tabletop display would look good during the day as well as at night. Ferocactus glaucescens in a gold-painted, terra-cotta pot glows with mini lights. Here’s how I did it, step-by-step. 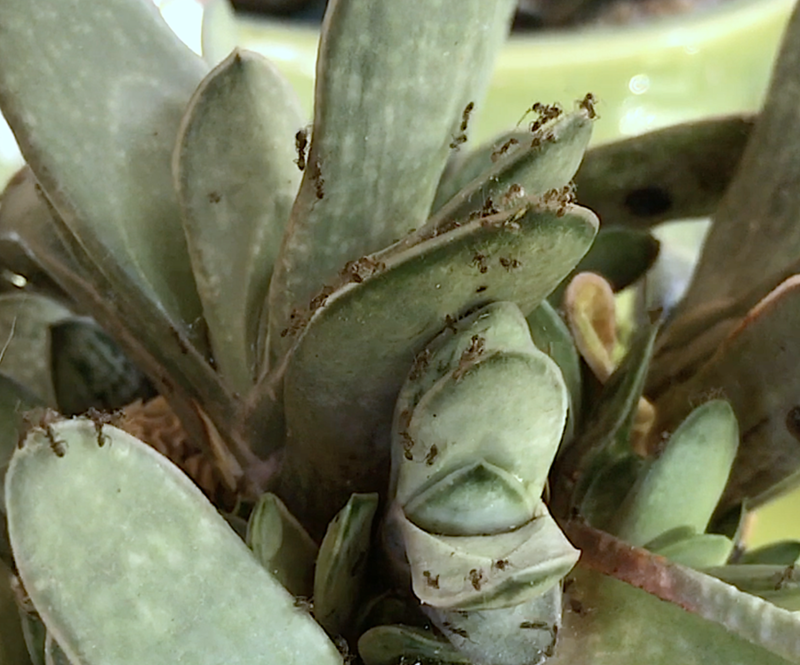 If you’re decorating an in-ground cactus or one that’s already in a pot, skip to #7. My ferocactus is shaped like a pumpkin and is 7 inches in diameter (including spines). Step #1: Select a spherical, long-spined cactus from the nursery. I chose Ferocactus glaucescens because its spines are quite long, and I like the plant’s blue-green color. In retrospect, I would have counted the number of ribs and gotten a barrel cactus with 10. This one has 12—two more than the number of lights in the package. But most arrangements are viewed mainly from one side, so the “dark” side is in the back, along with the battery pack. Step #2: Choose a pot or container that’s in scale with the plant. I went with a new terra-cotta pot because I wanted something clean and simple that would elevate the plant, and that I could paint the same gold as the spines. Tools and materials include long handled tweezers, a soft brush, a wood chopstick, mini lights, kitchen scissors, gold stones, floral pins, a disposable paintbrush, gold paint and water sealant. Step #3: Head for the craft store. At my local Michael’s, I bought gold “patio paint,” a disposable brush, floral (“greening”) pins, and battery-operated lights. I already had a wood chopstick, a can of Thompson’s Water Seal, long-handled tweezers and the kitchen scissors I use for gardening. Step #4: Paint the outside and inner rim of the pot with outdoor craft paint and spray the inside with the waterproofing sealer. Step #5: Gauge the size of the plant’s rootball in relation to the shape and depth of the pot. 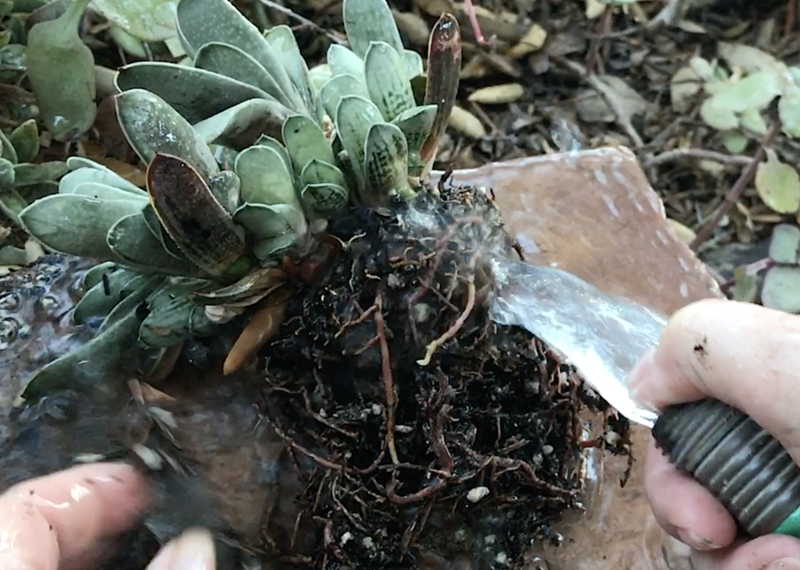 Add soil (I simply used pumice—up to you) if you’ll need filler for the bottom. Otherwise you risk plopping the plant into the container and finding it sits too high or too low. Which means picking up the ! @#$% porcupine again. Step #7: Settle the plant in the pot. I adjusted it a bit using the bathroom brush and newspaper, then pushed down on the soil along the rim with the tips of my long-handled tweezers. Step #8: Turn on the mini-lights to make sure they work. Start with the light on the end of the string and, using the long-handled tweezers, tuck it between two ribs, under the lowest spines. Use floral pins to secure the wires and conceal them. Remember they’re there when it comes time to remove the lights or repot the plant. The pins will rust in the soil and… Step #8.5: Get a tetanus shot. Gold rocks are $14 for 1.65-lb jar. Small pebbles would work as well. Step #9: Add topdressing. I used gold rocks that I found online. Wait a week to water it. 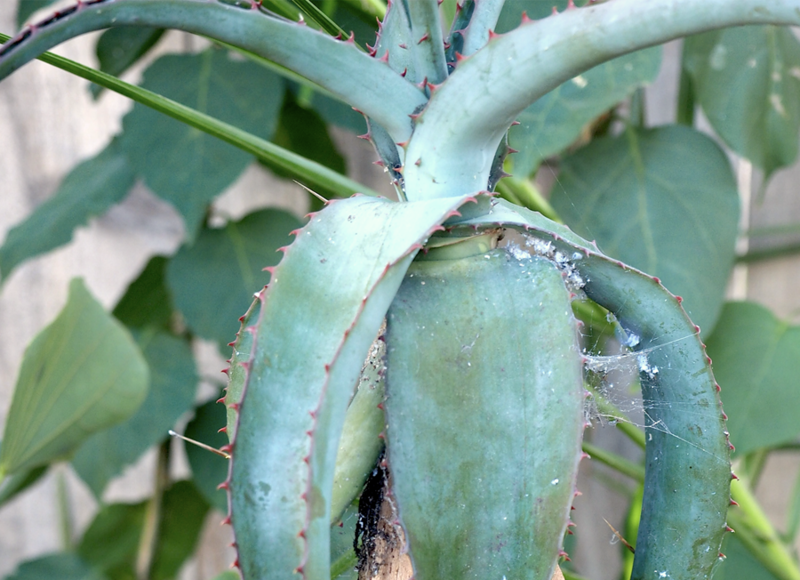 Cactus roots really shouldn’t be watered immediately after planting because broken roots are more vulnerable to rot. Step #10: Place it where you can see it at night. Take photos and post them on Instagram or Facebook and tag me @DebraLBaldwin. I’d love to see what you come up with! This is how the cactus looks after dark. And at anytime, it looks like a snowflake. Watch me make it on YouTube: Decorate a Cactus with Holiday Lights DIY.